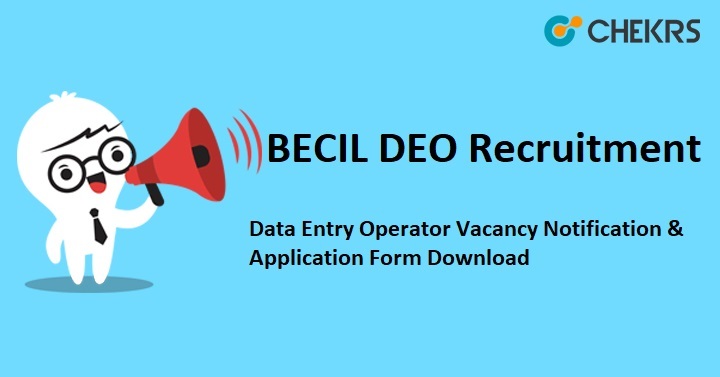 BECIL DEO Recruitment 2018: Broadcast Engineering Consultants India Limited (BECIL) has announced employment notification for inviting candidates to fill BECIL DEO Recruitment 2018 Application Form. Well, skilled and eligible candidates can apply for r Data Entry Operator Vacancy in prescribed application format. Candidates completed the application process until 14th September 2018. Therefore, candidates can get all information related BECIL Jobs such as eligibility criteria, important dates, application process, application fee, selection process below in this post. Candidates need to download the application form from the official website of BECIL or our page. Here we are giving the BECIL DEO Recruitment Application Form Link and steps to download the application form from the official website. Candidates are informed that the duly filled in application form along with self-attested photocopies of educational/ experience certificate, 2 passport size photograph and registration fee by cash or demand draft drawn in favor of “BROADCAST ENGINEERING CONSULTANTS INDIA LIMITED” and send to the postal address which is given below. Choose the Vacancy Link and Search the recruitment/empanelment of following manpower purely on contract basis for deployment in a government office at Chennai. Fill the application form in correct manner and send to the postal address. Remarks: In the case of any query related to BECIL DEO Recruitment 2018 please mention your valuable comment in the section below provided and we will respond to it shortly.